So happy that finally I encountered a whale shark in my life!!! Yeahhhh!!! I made my way to Bentar Beach, Probolinggo, East Java only to try my luck to see whale sharks. I wasn’t lucky on my first day. It was raining hard and no boats going out to the sea. Me and Andy went back to the hotel with blue face :(. 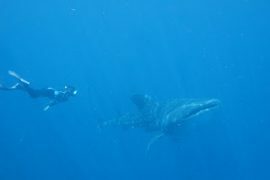 After having fun swimming with the whale shark, we didn’t continue our mission in finding another whale sharks. Why? We thought that the water was too murky. We couldn’t even see the whale shark underwater even though it was right in front of us! Satisfied with seeing only one whale shark, we told the Captain to drive the boat back to the shore.